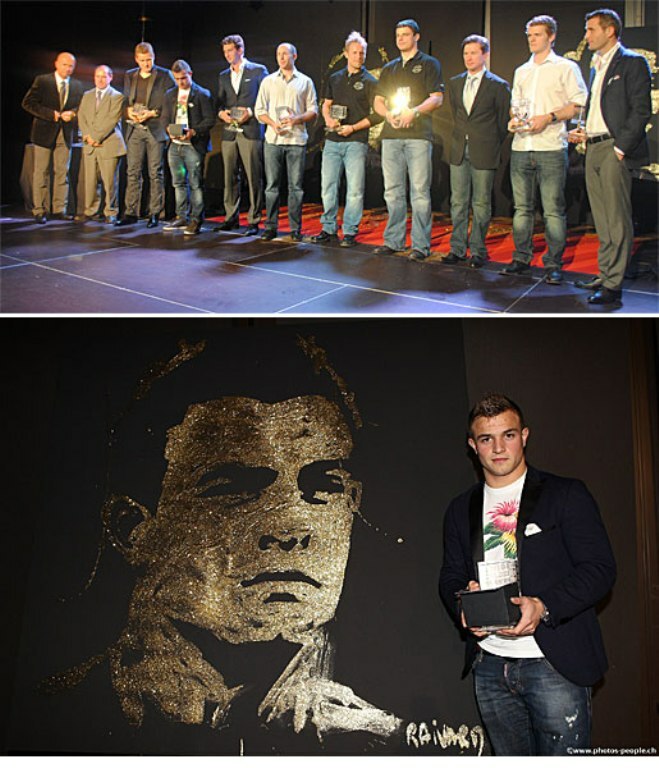 The Swiss professional footballers’ association SAFP handed out its Swiss Golden Player Awards 2011. Xherdan Shaqiri is the youngest winner ever of this Best Player Award. All professional footballers in Switzerland (first and second division) were asked to participate in the election for the Golden Player Awards for the 2010/2011 season. Shaqiri not only received the award for Best Player of the Swiss Super League, he also collected the trophy for Best Midfielder and Best Young Player. Last year, he was also voted the Best Young Player. In the 2010/2011 season, his second full season as a professional footballer, Shaqiri established himself as a real force in the Swiss Super League. The left footed midfielder helped FC Basel 1893 repeat as Swiss champions, playing 29 games and scoring 5 goals for the club he already joined in 2001. Shaqiri became a regular in the Swiss national team. In total the twenty-year old midfielder has made 17 appearances for the Swiss team, scoring 4 goals. Shaqiri helped Switzerland’s U-21 team qualify for the 2012 Olympic Games in London. In 2006, Mladen Petric was the first winner of the Swiss Golden Player Award. Hakan Yakin (2007/2008), Almen Abdi (2008/2009) and Seydou Doumbia (2009/2010) picked up the award in the subsequent years. The Swiss players handed out four more awards: Andris Vanins (FC Sion) was the Best Goalkeeper, David Ángel Abraham (FC Basel) was the Best Defender, Alexander Frei (FC Basel) was the Best Forward and Silvio (Lausanne Sport) was the Best Player of the Challenge League (the second division).